This breccia (front and back views of a polished slice and details in Figs. 1-6) has been taken from lined-up hills between the western basin rim and the central-uplift chain. The hills are emerging from the Quaternary in the basin and may represent an analogue of an inner ring in circular impact structures. The Muschelkalk limestones of the hills are heavily fractured through and through displaying grit brecciation, mortar texture and cataclastic flow texture. In many parts, whole networks of monomictic and polymictic breccia dikes crisscross the rock. Frequently, signs of decarbonization are observed, and vesicular white material may be interpreted to be relics of carbonate melt. Fig. 2 … and back of a slice cut from the Singra impact breccia. Fig. 4. Breccia dikes (partly filled by secondary calcite) and beginning decarbonization/?melting (the white spots). Fig. 5. Cataclastic flow texture and beginning decarbonization/?melting. Fig. 6. Possible relics of carbonate melt in a breccia dike. Fig. 7. Monomictic movement breccia (Jurassic limestones) displaying grit brecciation and mortar texture. Many fragments seem to have been affected by decarbonization (from shock or frictional heating). Several fragments show a distinct zoning of the decarbonization (see the close-up in Fig. 8). Fig. 8. Close-up of breccia clasts in Fig. 7. Note the distinct zoning of decarbonization. Monomictic movement breccia in the megabreccia between Escorihuela and El Pobo/Corbalán. Fig. 9. Typical mortar texture of an impact monomictic breccia. Peculiar breccia in the megabreccia between Escorihuela and El Pobo/Corbalán. Fig. 10. 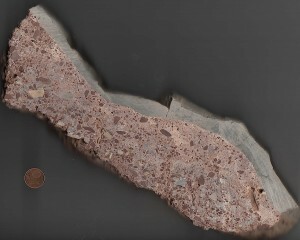 Peculiar setting of a polymictic breccia composed of Muschelkalk and Buntsandstein fragments in sharp contact with a plastically deformed Muschelkalk limestone layer. Enlarge by clicking! Fig. 11. This sample was taken from near the wall of a prominent breccia dike. The breccia is exceptional insofar as it is composed of fragments of the host rock only (Muschelkalk limestone), floating in a matrix of accretionary lapilli (lapillistone). Obviously, the injected lapilli material from the impact explosion plume was hot enough to marginally decarbonize the Muschelkalk limestone fragments (see the close-up in Fig. 12). More about the accretionary lapilli on http://www.impact-structures.com/impact-spain/the-rubielos-de-la-cerida-impact-basin/accretionary-lapilli-in-the-suevitic-basal-breccia/ and on http://www.impact-structures.com/2011/12/accretionary-lapilli-from-the-azuara-and-rubielos-de-la-cerida-impact-structures-spain/. Fig. 12. Close-up of Fig. 11: Beginning decarbonization of Muschelkalk limestone clasts in a lapillistone matrix. The formation and emplacement of the basal suevite breccia must have been a very complex process, as has already been discussed for the basal breccia in the Azuara structure (see Ernstson & Fiebag 1992). Not only the breccia clasts show multiple generations of fracturing (breccias-within-breccias), but there are also generations of breccia matrices demonstrating a succession of flow, solidification, fracturing and emplacement as clasts without mixing of the different matrices (see, e.g., Fig. 12). Fig. 13. Generations of breccia matrices: formation of the grayish breccia matrix with flow texture – solidification – fracturing and embedding (or vice versa) of the first-generation matrix clasts in the second-generation, reddish matrix.